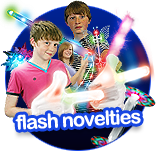 If you’ve ever attended a large event or concert, then you’re very likely to have come across flashing novelties. Rapidly becoming as popular as the sale of food and drink at entertainment venues and events, flashing toys and novelties are irresistible to children and adults alike making them perfect for sale at fundraisers and to help boost profits behind events, festivals and performances. 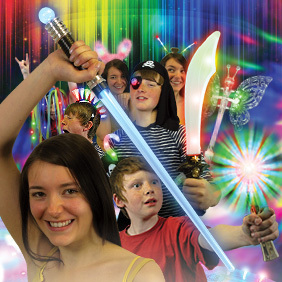 Bright and colourful flashing toys such as laser swords, head boppers, wands and flashing windmills promote an exciting atmosphere with colourful flashing lights that really appeal to audiences of all ages. Relatively inexpensive to buy, flashing novelties hold fantastic margins for profit or fundraising and can really make the difference between mediocre and successful returns at an event. Seasonal celebrations such as Halloween and Bonfire Night present fantastic opportunities for the sale of flashing novelties. Themed flashing toys such as the Mystical Lantern, Arrow Headbands and Devil Horns are perfect for promoting a fun themed atmosphere, although the dark nights and general excitement lend themselves perfectly to the super bright flashing lights from a whole range of light up toys. Christmas presents a wide range of opportunities for the sale of themed novelties and gifts. Novelties are perfect for parties, school plays and pantomimes’ to encourage the enchanting atmosphere and audience participation (oh yes they are!). The fabulous Mystical Lantern can also be used as a prop for performances and carol concerts for a magical, festive atmosphere. Seasons aside, flashing novelties make a fun and colourful addition to events and celebrations all year round. Use specific novelties to theme your event or go all out and enjoy a wide range of light up toys that’ll make your event all the more exhilarating for party goers and provide effortless fundraising. Brilliant fun! Flashing novelties achieve their spell binding effects using colourful, multi function LED’s that are powered by batteries ranging from standard AA’s to cell batteries. 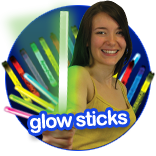 All Glowsticks.co.uk flashing novelties come with batteries included and are ready to go so that they can be enjoyed with immediate effect. Because flashing toys contain batteries, it’s advised that they’re stored in a dry environment so as to prevent corrosion in the battery pack. 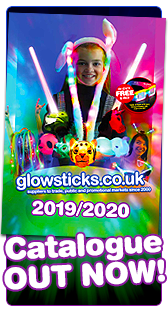 All novelties are guaranteed for twelve months and if stored correctly should last well within this time frame, however if any failures are experienced Glowsticks.co.uk are more than happy to exchange or offer a full refund. Pack sizes range from one single item to cases up to and above one hundred and forty four so that you have just the right amount of novelties for your event and many have been branded and packaged to add value to your presentation. Flashing and light up novelties provide hours of enjoyment, however all good things must come to an end and so once you come to dispose of your novelties, please take them to your local recycling centre and dispose of in line with your local authority’s guidelines. Let’s help to make the world a better place!